Blessed with good bones, this suburban home just needed a designer’s touch to transform it from ordinary to sophisticated. By choosing luxurious window treatments, surprising art, visually exciting textures and colors, and an eclectic selection of furniture styles, the client’s were able to inject a city vibe into a suburban setting. Originally a spec home with less-than-perfect finish materials, the house first needed baseboards, plumbing fixtures, new vanities, and lots of paint and lighting modifications before it was ready for furnishings. 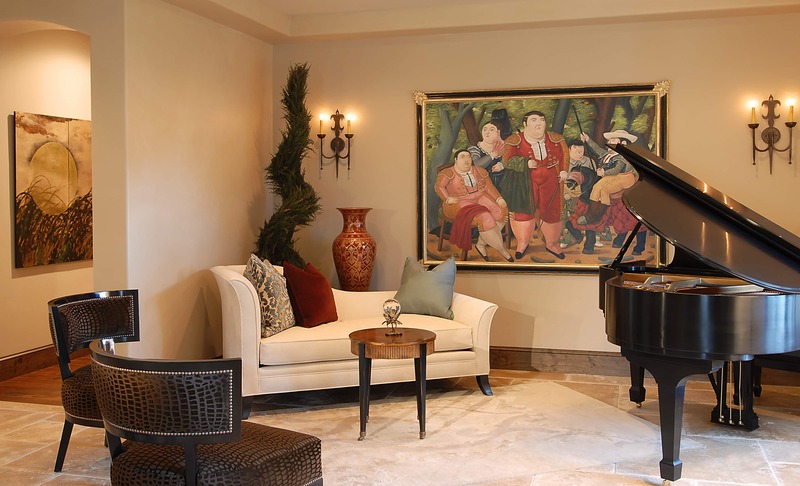 Then, with fine art fine, fine rugs, and a grand piano serving as the spark for the color palette, the furniture comes together in groupings in the two halves of the living area. Off to one side sits the elegant library with its crocodile leather desk accessories and embossed leather wall hanging. The kitchen brightened considerably thanks to a set of six framed tea box labels and a properly scaled island light fixture. The master bedroom features a color scheme taken from the gold crane screen and topped off with romantic, motorized cloth roman shades. Click Image below to view more pictures of this Interior design project. Traci Shields, with 28 years of design experience, takes a holistic approach to each project, overseeing all the details so that every element, inside and out, is consistent with the overall design theme. Traci’s attention to detail and demand for excellence makes her one of the most sought after interior designers in the industry.